To help fill in the gap between now and the start of next season, I've started to put together some stats for all of Swansea's league games last season. The plan is to hopefully get a better idea of what went well and what can maybe be improved upon. The first area I'm looking at is the relative points per game each player got for every game they started. The reason I've looked at this first is that despite all the criticism he got ('I was there when Shechter scored') etc., I had a feeling that Itay Shechter would actually have a decent return. Points gained from matches where that player started (regardless of how much they played or score if/when subbed). 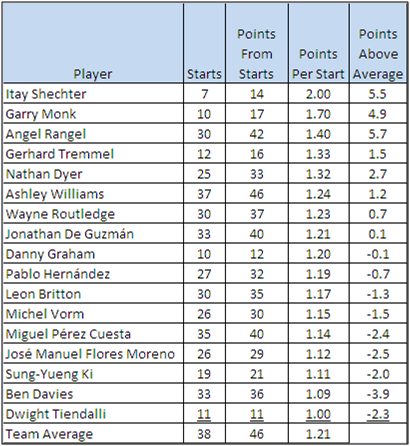 Points above average is the points they gained compared to the team average of 1.21 per game, this is to give a bit of a guide to how much better (or worse) than average results were when that player started. Extrapolating averages is always asking for trouble and here you could argue if the trend of 14 points from 7 starts continued over a season, then Swansea would have finished 3rd in the league and in a Champions League place had Shechter started every game! This ignores the fact that in a number of his starts the team didn't go ahead until after he was substituted. However while Shechter was certainly no world beater, arguably the greatest thing he brought to the club was to act as a lightening rod for most of the negative feelings about the team probably saving Pablo and Ki a lot of (usually unjustified) criticism. Anyone looking at this and seeing Shechter top and Ben Davies towards the bottom will probably say that the figures are complete cobblers and to some extent they'll have a point. I don't think anyone would say Davies has not been a major part of Swansea's success last season. The main reason Davies' figures are comparatively bad is that he didn't start the first 3 games which Swansea got 7 points from (QPR/West Ham/Sunderland). This highlights that as well as the 'on the beach' accusations from mid-Feb onwards you could argue that taking those 3 games out, form was of lower mid-table standard for most of the season. Over the last 35 games of the season Swansea picked up 39 points compared to Aston Villa's 40. I don't know if it's possible to be on the beach from September onwards but the confidence gained from that early buffer certainly helps reduce pressure and increase self belief and also relates to the idea of luck (good and bad) that I'm planning to look at in my next post.